Status: Common regular spring migrant statewide. Fairly common regular breeder west and central, rare casual northeast. Rare regular summer visitor east. Common, locally abundant, fall migrant statewide. 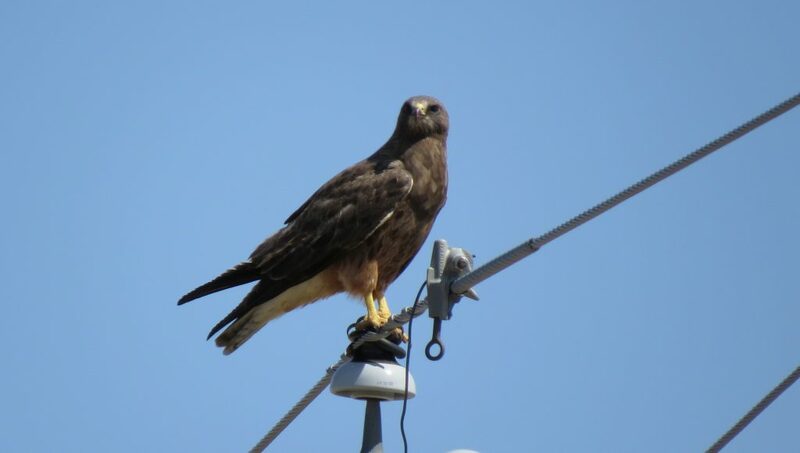 Documentation: Specimen: UNSM ZM12521, 17 Jun 1901 Monroe Canyon, Sioux Co.
Swainson’s Hawk has three color morphs, light, intermediate (rufous), and dark, although they comprise a continuum (Wheeler 2003). Intermediate and dark morphs do not breed east of Colorado and Wyoming on the Great Plains, where 99.9% of breeding Swainson’s Hawks are light morphs (Wheeler 2003). During fall migration, however, intermediate and dark morphs comprise about 60% of migrants in eastern Colorado (Wheeler 2003). The dark and intermediate (rufous) morphs are probably under-reported in Nebraska. There at least 10 reports of the dark morph, and most flocks of migrants, if checked carefully, likely contain at least one. A flock of 250 in a Clay Co hayfield 1 Oct 2018 contained at least 20 blackish birds. The intermediate morph has only been reported twice. One was in Lincoln Co 29 Aug 2004, and different single birds were photographed in Fillmore Co on two occasions. There is an earlier date 22 Mar 2011. Arrival dates are difficult to determine based on existing data, which include many undocumented Feb and early to mid-Mar reports which we disregard. The earliest Nebraska specimen date is 7 Apr 1994, UNSM ZM17074. Migrating flocks peak in south Texas in mid-Mar (Wheeler 2003), first arrivals in Kansas are in late Mar (Thompson et al 2011) and early dates in South Dakota are 19-22 Mar (Tallman et al 2002. Numbers peak in mid- to late Apr, and stragglers occur in areas outside the breeding range until early Jun; most of these stragglers are non-breeding immatures, which occur through the summer over most of the state (see Summer). Spring migratory flocks are much smaller than in fall, usually only 12-20 individuals. Migrants are often observed following implements working farm ground; a large flock of 155 birds was in a single field being worked in the eastern Rainwater Basin 21 Apr 2006. High counts: 300 in the eastern Rainwater Basin 17 Apr, 155 in the Rainwater Basin 21 Apr 2006, and 93 there 18 Apr 1998. Summer: This species occurs in the west and central in summer and is rare or absent in the east where numbers have declined in recent years. Highest densities occur in the Sandhills and the plains habitats of the southwest and Panhandle. Densities can be high in the west; in 2007, 107 nests, 70+ of them active, averaging 2-3 chicks, were located in the southern Panhandle, mostly in Kimball Co. Mollhoff (2016) showed confirmed breeding only east to Boone Co, with “probable” breeding east to Platte Co; this is a decline from 1984-89 (Mollhoff 2001). Jorgensen (2004) considered it a “rare summer visitor or breeder” in the eastern Rainwater Basin, citing fewer than 10 breeding records. However, a few years later Jorgensen (2012) stated that it “apparently no longer breeds” in the Rainwater Basin; most recent sightings are likely immature non-breeders. Similarly, the few breeding season reports from southeast Nebraska east of the Rainwater Basin are of single birds; most reports are from Lancaster Co. BBS data for 2007-2013 show highest densities in the west, and absence east of a line from Knox Co to Franklin Co (Sauer et al 2015). Wheeler (2003) shows essentially the same breeding distribution in Nebraska. Despite declines in portions of eastern Nebraska, BBS trend analysis shows an annual increase of 1.64% (95% C.I. ; 0.14, 3.13) during the period 1966-2015 (Sauer et al 2017). Active nests: 18 Apr-22 Jun. The latest Nebraska specimen date is 12 Nov 1937, HMM 21764, and the latest specimen date for Colorado is 22 Nov 1985 (Andrews and Righter 1992). Hitchcock Nature Center Hawk Watch data show migration extending from mid-Aug through late Oct, with a well-defined peak in early Oct; average annual tally is 1107 (Hawkcount.org 2017). In Nebraska, peak migration is marked by large flocks, numbering into the thousands, as in Lancaster Co 2 Oct 2002 and Rock Co 29 Sep 2007; the five highest counts for the state are in the short period 29 Sep-2 Oct (see High Counts). Most of these very large flocks have been observed in central Nebraska. A fledgling banded in California in summer 2011 that was also carrying a transmitter was seen in the Sioux City area in mid-Sep 2011. High counts: “thousands” in a Lancaster Co field 2 Oct 2002, “thousands” in a Rock Co field 29 Sep 2007, as many as 2500 at Valentine, Cherry Co 29-30 Sep 1973 (Menzel 1974), 2ooo in Dodge Co 29 Sep 2018, 1000+ over Seward 2 Oct 2001, 500-1000 in Dawson Co 28 Sep 2012, “hundreds if not thousands” near Sutton, Clay Co 1 Oct 1944 (Wampole 1946), and 557 in Knox Co 1 Oct 2002. Swainson’s Hawk (dark-morph) in Fillmore Co 3 May 2014. Photo by Joel G. Jorgensen. Hawkcount.org. 2017. Hawkwatch Site Profile: Hitchcock Nature Center, accessed 22 May 2018. Jorgensen, J.G. 2004. A preliminary assessment of eastern Rainwater Basin birdlife. Published by the author, Blair, Nebraska, USA. Menzel, K.E. 1974. Hawk concentration at Valentine. NBR 42: 19-20. Sauer, J.R., J.E. Hines, J.E. Fallon, K.L. Pardieck, D.J. Ziolkowski Jr, and W.A. Link. 2015. The North American Breeding Bird Survey, Results and Analysis 1966 – 2013. Version 01.30.2015. Wampole, J. 1946. Miscellaneous Nebraska bird notes. NBR 14: 22. Wheeler, B.K. 2003. Raptors of Western North America. Princeton University Press, New Jersey, USA.